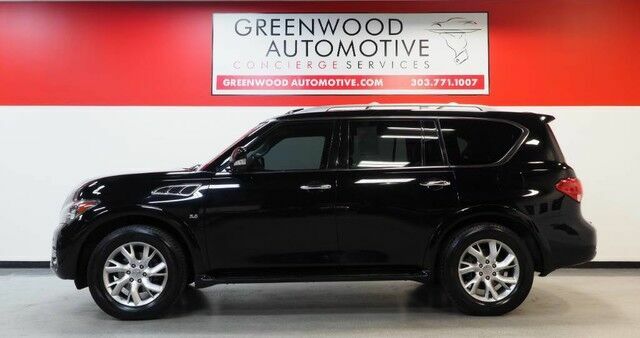 Looking for a clean, well-cared for 2014 INFINITI QX80? This is it. If you're in the market for an incredible SUV -- and value on-the-road comfort and manners more than ultimate off-road prowess or tow capacity -- you'll definitely want to check out this INFINITI QX80 . You deserve a vehicle designed for higher expectations. This INFINITI QX80 delivers with a luxurious, well-appointed interior and world-class engineering. This INFINITI QX80 is equipped with AWD for improved handling. Whether you're faced with inclement weather or just out enjoying the twisting back road, you'll have the grip of AWD on your side. Intricately stitched leather and ergonomic design seats are among the details in which test drivers say that INFINITI QX80 is in a league of its own The interior of this INFINITI QX80 has been through meticulous inspection and could almost pass for a brand new vehicle. This impeccably built INFINITI QX80 comes with a plethora of added features that have made this vehicle a unique find. These options will simply amplify the experience of owning and driving this wonderfully crafted INFINITI. More information about the 2014 INFINITI QX80: The QX80 is a large luxury truck that is both elegant and comfortable, yet its body-on-frame layout allows a tow rating of up to 8,500 pounds. Ride comfort and handling are also quite good and the big 5.6L V8 and 7-speed automatic make an agreeable pair with strong responsiveness. Three rows of seating accommodate up to eight passengers, which makes the QX80 a good pick for families. Inside, the cabin is a standout, with a quiet, refined feel, lots of standard and available technology and great ride quality. This model sets itself apart with three rows of seating, quiet cabin, available safety and entertainment technology, Strong V8 powertrain, and refined ride WWW.GREENWOODAUTOMOTIVE.COM for all Photos Our Dealer Handling fee of $499 is included in our advertised price. Government fee's and licensing are additional costs. For best service and to check availability or to set an appointment to see and drive call Steve direct at 720-339-1516 or Marc at 303-552-7909 For more information. FINANCING AVAILABLE. TRADES WELCOME. *VEHICLE IS FULLY INSPECTED BY OUR MECHANIC. We are located 4 Blocks West of I-25 on North side Of Arapahoe, Behind US Bank at Syracuse St.